I was always thin, extremely thin. When I got married at the age of 24 I weighed 48kg. I stayed this weight even after my children were born. But in my 40s I suddenly gained weight for no reason. I had not changed my eating habits, exercise regime or anything that was glaringly obvious. I thought that I was eating a pretty healthy diet. Whole grain low GI breads, low fat or fat free, etc. but the weight started piling on for no reason. Before I started banting I was always ill. Although I didn’t eat a lot, I kept on gaining weight especially around my stomach. I tried all kinds of diet plans. I even tried going to gym, but the stomach remained and this was so demoralizing. I was constantly ill. There was not a month that went by where I didn’t have some cold, IBS attack and I also had constant headaches. I was also diagnosed with Fatty liver disease. Then I was at a family function and I saw that my sister-in-law and my brother had lost a huge amount of weight. They had packed in their own cauliflower rice and brought it along and I was really curious. They told me that they were doing the Tim Noakes diet. Of course I was going to try it, I’d tried everything else. They explained that it was a low carb High fat diet and that their medical numbers had improved remarkably. I asked about the food etc and they told me to go out and buy the RMR book. My daughter bought my husband the book for Father’s Day and so our journey began. I started banting in July and gained weight at first because I was simply eating way too much. To be honest, I was cheating too because I did not understand the science. I realised that you either do it properly or you don’t so it at all and I started afresh. On 14 September 2014 I started banting properly. No more cheating and I cleaned my house of all carbs and sugars. I also began to focus on making sure that I was not over-eating for my body type and that is when the weight started falling off and I started getting healthier and healthier. No longer was I always suffering from constant ailments. I also had more energy than I’d had in years. Now I am 17kg lighter and the huge stomach is gone. My husband also lost 30kg and his diabetes is controlled for the first time in 23 years. My medical numbers are perfect. I will never give up this life style. It works for me. Banting is a lifesaver for this family. 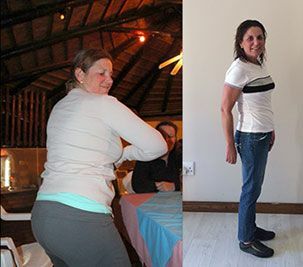 My brother and his wife stopped banting and started weight watchers in November 2014. They have stayed thin, but unlike when he was banting, his cholesterol levels are now raised.